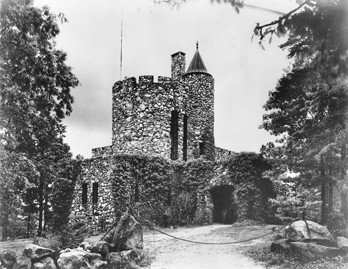 Gimghoul Castle in Chapel Hill is a large stone building constructed in the style of a medieval castle or fort, situated on Point Prospect (sometimes known as Piney Prospect) in Battle Park. It is the lodge and headquarters of the Order of Gimghoul, a student society of secret and exclusive membership at the University of North Carolina. Founded in 1889 and initially occupying a lodge at the corner of Boundary and East Rosemary Streets, the Order of Gimghoul organized around the imaginative speculations of Wray Martin, a student who received his law degree in 1891. Strongly influenced by Sir Thomas Malory and other medieval chroniclers of the Arthurian legends, Martin enjoyed retiring at night to Point Prospect to write his private mythology. Martin created a "City of the Gimghoul," surrounded by a great, island-dotted sea and defended by a castle or fortress on the spot where he indulged in his reveries. The story of Peter Dromgoole inspired him to use the name "Gimghoul." Dromgoole, a student at the university in the 1830s, supposedly fought a duel on the same promontory over the affections of a girl named Fanny, leaving his own or his opponent's blood indelibly splattered on a rock at the site. In 1915 the Order of Gimghoul began a complicated series of land transactions to acquire Point Prospect and its environs, employing a group of stonemasons from Valdese (descended from the medieval Waldensians of southern France and Italy) to build the castle. Completed in 1926, it retains its aura of mystery and romance while functioning as the social and fraternal center of the order. Louis Round Wilson, Historical Sketches (1976).